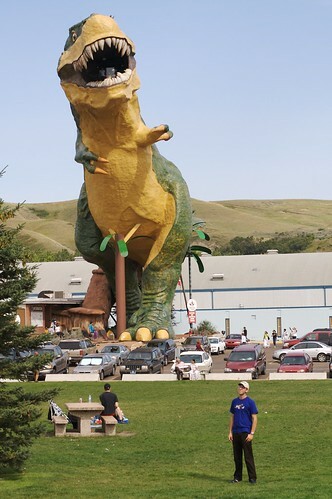 World's largest dinosaur statue is a giant Tyrannosaurus rex in the town of Drumheller, Alberta, Canada. The area is known as dinosaur valley and Canada's largest collection of dinosaur fossils are housed in the nearby Royal Tyrrell Museum of Palaeontology. The statue is about four times larger than the estimated height of real T-rex and has a staircase inside through which one can reach into the gaping mouth of the giant and view the scene outside. The platform behind the giant's pearly white teeth can accommodate about 12 persons at a time. Image from Flickr is by arewethereyet? Image from Flickr is by Geoff S.